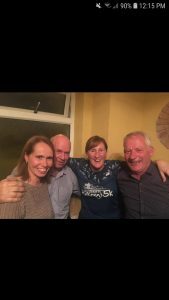 A great night was had on Holy Thursday night in The Pound Ballycallan. A great turnout with 20 tables. A huge thank you to the McGrath family for organisation, premises, food and prizes. A thank you to Billy Neary for being quiz master on the night and to Anne Murphy and Siobhan O’Brien for doing corrections. Thanks to any one who helped in anyway on the night and to everyone who donated prizes and made sandwiches, much appreciated. Thank you to Avonmore and Celine Egan for sponsoring quiz prizes. Well done to the winning team of James Cahill, Mary Murphy, Mary McCluskey and Sean Casey who received an Avonmore Hamper each. The GBC Juniors had their first League match last Saturday evening 13th April, in a cold and blustery Larchfield. There are eleven teams in the group which will mean this group of players will have ten matches over the coming months. After the excitement of 2018 it was back to basics on Sunday 7th April when GBC started their Senior campaign with an eagerly anticipated opener against city side Dicksboro. 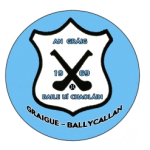 U14 County Camoige —Munster Cup LIT. 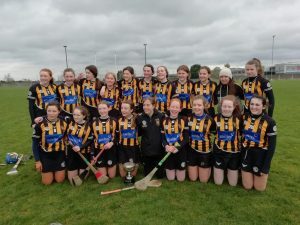 Congrats to Kilkenny U14’s who were victorious beating Limerick/Clare/Galway/Cork and Limerick in Final! St. Brigid’s were represented by Lauren Ronan who played and had the honour of captaining the Team. Also, Kilkenny reached the Shield Final and were runners up to Laois in the Final. Here St. Brigid’s were represented by Katie Maher and Ava Brett! Well done girls!! The annual Mary McGrath Table Quiz will take place in the Pound, Ballycallan on Holy Thursday night 18th April. Tables of 4, €20 per table. Come along for a night that always guarantees a laugh and great social night. All Welcome. Our Minior girls travelled to Gowran on Tuesday 9th April off the back of a great win over Piltown the previous week. The girls put in a great first half against a very strong and up to the age Gowran side. The scoreline at half time was Gowran 1-9 St Brigid’s 0-3. Gowran came out like a force to be reckoned with in the second half. Our young girls put in great determination and teamwork but were broke down by this Gowran side at every chance. The final score does not reflect the effort put in by this young St. Brigid’s side. Final score Gowran 5-13 St Brigid’s 1-8. 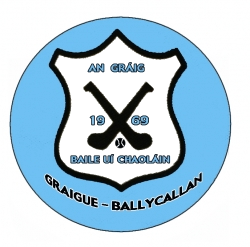 Our U14 girls started their league campaign on Monday 8th April v Gowran in Tom Ryall Park. Gowran started the better side but that didn’t stop St. Brigid’s. When they got a hold of the ball, off they took with great determination and great skill they put a brilliant goal in the back of the net. Gowran ran at the St. Brigid’s girls throughout the first half but the girls put over a few more points and were winning by 2 points at half time. There was no stopping the St Brigid’s girlS in the second half, a great team performance was displayed and all subs coming from the line showing great impact. A brilliant result for our first match ending on a scoreline of St. Brigid’s 4-10 Gowran 3-6. 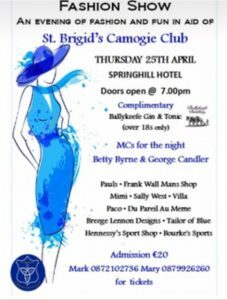 St. Brigid’s Camogie Club are hosting a Fashion Show in Springhill Hotel Kilkenny on Thursday April 25th. Doors open at 7pm with show commencing at 8pm. Admission €20 includes free Ballykeefe G&T. Excellent door prize and raffle on the night. Admission for children/teenager 2nd level €10. Looking forward to seeing you all at this great fashion show. 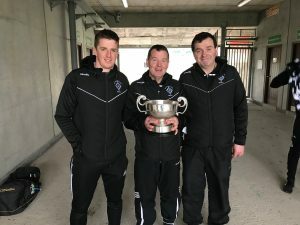 Well done to our clubmen Killian Egan, Aaron Brennan and Stephen Keoghan who were crowned All Ireland Colleges champions with St. Kieran’s College on Saturday 30th March 2018 and to St. Kieran’s Manager Tom Hogan who has had such an important involvement with our club over the years. 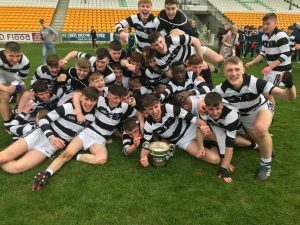 St. Kieran’s were up against Presentation Athenry and came out winners on a scoreline of 1-15 to 1-12 with both Aaron and Killian getting on the scoreboard, Aaron with 1 point and Killian with 2 long range points in the dying moments, both with a very significant contribution all over the pitch! Another very proud day for our little parish!